BB2 Update: As at 5.30am IST, Sunday, the system is stationary over East MP and adjoining Chattisgarh, with a trough extending vertically Southwards. The North/South trough deepens off the TN coast on Sunday Morning. BB2: Update at 11.45 pm IST Saturday. Situated at 998 mb over East MP, with clouding in the S/SW quadrant. AWC image superimposed by vagaries...Movement track shown...."X" marks fizzling out. As BB2 moves W/NW, its precipitating good rains along.. During the day on Saturday, Angul in Orissa measured 100 mms and Gopalpur 8 cms. Hardoi in adjoining UP measured 7 cms on Saturday. Inter Active Page on this blog has the latest 20th July, Update of the All India Rain Toppers of the Monsoon...Specially prepared meticulously by Pradeep for "Vagaries" and his own "Tamil Nadu Weatherman". Thanks Pradeep for the effort and Interesting List. We had anticipated a heat spell in sindh Pakistan and adjoining India (see vagaries forecast map), and hot it was indeed ! Turbat (Pakistan) soared to 49c !Dal Bandin was 44.5c and Nawabshah 42.5c. Hyderabad (Sindh) was 40c. In India, Saturday, Barmer (Rajasthan ) was hot at 40.6c, Jaisalmer at 39.3c and Hissar at 38.4c. Rainfall spreading into Vidharbha and East Marathwada. On Friday/Saturday, The heavy rainfall predicted for Sunday in Northern AP has moved in a day earlier, on Saturday itself. Northern AP (Telangana) areas recieved good rains, with Golkonda topping at 163 mms, Hyderabad at 115 mms, Hakimpet with 95 mms and Khammam 44 mms. Vagaries did not predict the rainfall to reach as South as Hyderabad. In Srikukakulam, Palakonda topped with 120 mms and Kalingapatnam with 115 mms. And, while the AP rains have moved in a day too early, the rains for Vidarbha and Marathwada will be on date, Sunday. Hyderabad will be cloudy with light rains, but some sharp showers in the evening. Northern AP will get heavy rains on Sunday. All India Forecast for Mon/Tuesday/Wednesday will be put up Sunday evening. 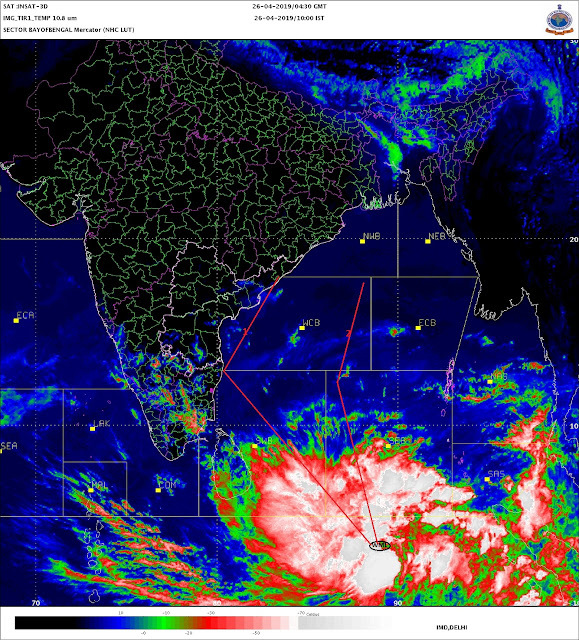 But, the rains for Konkan and Mumbai, will have to pushed a day late, into Monday. Sunday's forecast for Mumbai stands revised to a Sunny spells and cloudy by evening. few afternoon showers in some parts : Rain Amount reduced to 12-15 mms. In the meantime, till mid night today, see Space News Page for a very interesting piece on "The Habitable Worlds "in the Universe..
@ Rajesh sir. Thank you very much for helping and clearing the doubts on air pressures . So North Konkan rainy day going further on Monday ! Today subdued activity given just 3mm rain here. And it was more sultry day ! And with help of LOW and it's associated UAC can we expect off shore getting stronger on Monday/Tueesday over North Konkan ! From the last 4 days no rain in Surat. Not even the slight drizzle. Weather has become more hot and humid. At present weather is completely cloudy. Now Satellite Image showing almost whole Maharashtra under Thick Cloud cover ! So Whether any quantity rains happening in any part of MH ! As at moment only overcast conditions at Mumbai, Badlapur, Pune & Nashik belt ! So whether rains are going on over Marathawada & Vidarbha region ! junaid: i have no knowledge of moon timings..
@ GSB. Here at Badlapur until yet no rains ! Some spells were fallen in early morning but after 8am just overcast ! No sun ! No rains & bit windy from SW side. 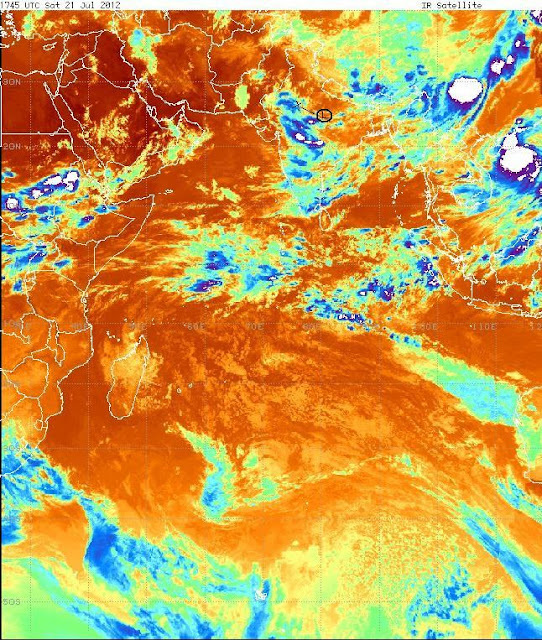 Yaa, Sat image showing thick cloud covers over whole Maharashtra moving west but in real over Badlapur they are thin whitish & silver layer clouds. But When arabian branch off shore trough are active then are dense thick grey & black low levels clouds which produce the rains surely when they pass ! But this Bay system until yet not producing any rains here !